Jubilee Nominations claimed to be sabotaged from within the party officials. - Bana Kenya News, Real African Network Tubanane. Home featured Nairobi Jubilee Nominations claimed to be sabotaged from within the party officials. Jubilee Nominations claimed to be sabotaged from within the party officials. 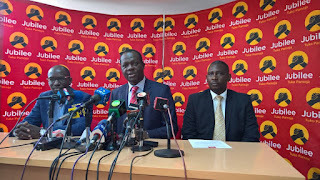 The Jubilee secretariat led by secretary general Raphael Tuju claimed to be a failed official in Jubilee. The jubilee nominations have encountered massive loopholes and fight within the officials. According to the secretary general, they had to fire several employees following irregularities. The Jubilee nominations which had massive irregularities include; Baringo County, Uasin Gishu, Kajiado, Embu, Kirinyaga and Kiambu. Some people were arrested with marked papers for several candidates. Raphael Tuju said that the all official communications will be given from the party headquarters at Pangani, Nairobi. The SG admitted it is logical nightmare that made the process to be a bit difficult. "The polling stations will not be closed until all the people have voted. The majority of the registers used were 2013 voting registers and that allegations are false. The only reasons why we thought to use very few ballot papers is because of voter Turnout." Said Tuju. "The party downloaded the current voter register from the IEBC and synchronised with the party members. So there are no worries about who is in the register or not." Added Tuju. According to the political analysts, the Jubilee party officials have already failed and it must be good to overhaul the whole process and plan afresh. The process has been manned with a lot of irregularities and discriminations. The president Uhuru Kenyatta and his deputy have been total disappointed by the Jubilee nomination Process as claimed by Political analyst Barack Muluka.